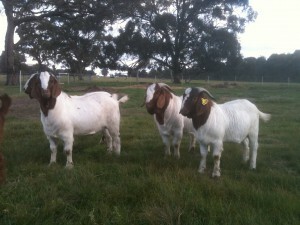 Dromkeen generally has a range of bucks for sale throughout the year. The majority of bucks sold by Dromkeen are CMI graded. This is an independent grading system based on the same type of systems used in the cattle and sheep industries and measures rib fat, rump fat, eye muscle area, intramuscular fat as well as a visual assessment of head, testicles, skeletal form, legs and hips. An assessment is also made of the animal’s temperament within a crush and the yard. This process culminates in a CMI point score (Carcase Merit Index). * CMIs are objectively measured indicators used to improve breed performance and meat traits. * CMIs are based on age, liveweight, Eye Muscle Area, Fat Depths (Rib and Rump) and Intramuscular Fat . * Animals with heavy liveweight, large eye muscle area, least fat depths and high intramuscular fat will be graded highest. CMIs should not be used in isolation but to make informed decisions about animals together with other relevant data such as Average Daily Weight gains, Feed Conversion rates, Structural correctness and Environment. Dromkeen uses Estimated Breeding Values (EBV’s) as well as CMIs for its herd improvement. For further information please contact Glenn on 0419 905 884 or glenn@glendalong.com.au or post an enquiry online.